Set up encrypted communication to send receive e-mail with maximum security. 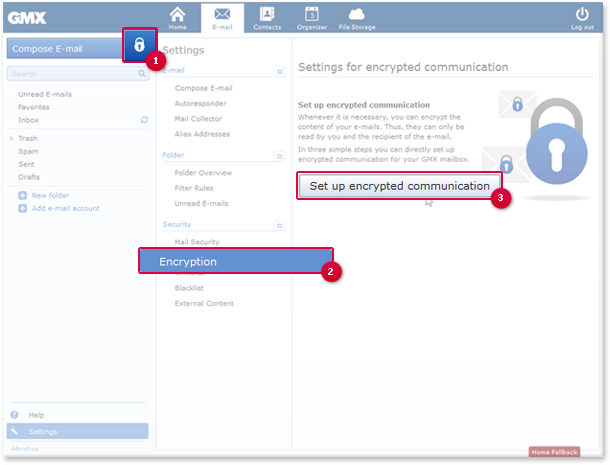 You're setting up encrypted communication for your GMX default address. To use encrypted communication, you neet to set it up once. During the setup, we will generate a pair of keys and store a secure backup if desired. How to set up PGP if you haven't done so before (on any device). You are using Mozilla Firefox or Google Chrome. Log into your GMX Account. In your inbox, click the lock icon next to the "compose" button. Click Set up Encrypted Communication. During setup, you will be asked to download and install the mailvelope extension. Mailvelope for further information on this addon. During setup, you will be asked to set a passphrase. This passphrase is needed to encrypt your private key to prevent abuse if stolen. You will need this passphrase each time you wish to encrypt or decrypt an e-mail. At the end of the setup process, you can create a backup of your key pair. This will not only allow for recovery if you forget your passphrase or lose your key files, but also allow your to use it with other devices such as smartphones, tablets or other computers. See Backup for further information. Print your recovery document and store it at a safe place for future reference. If you have set up a recovery document for your key pair, you can use it to set up Encrypted Communication on other computers. Use your "other" computer to to log into your GMX Account. In your inbox, click the lock icon next to the "compose" button. Click Download Browser Extension and install Mailvelope. Enter the recovery code on your recovery document. As soon as you have set up Encrypted Communication on one of your computers, you can also use it with the GMX Mail App. Start your GMX app and log in. Tap your device's menu button and tap activate PGP. Tap Scan QR code and point your device camera on the recovery document's QR code at the bottom right of your recovery document. If your device doesn't have a camera, you can enter your recovery code by hand. To do so, tap Recovery Code. 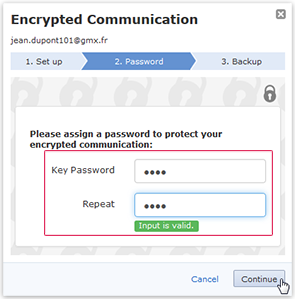 If you have already set up Encrypted Communication on your computer, you can also use it with your GMX Mail App. Start the GMX Mail App and log in. Tap the menu icon at the upper right. Tap Settings → Encryption → Activate mobile encryption. Start by exporting your key from your current mailvelope installation. See Managing Keys. Install the latest version of mailvelope. Click the mailvelope icon and then Settings. 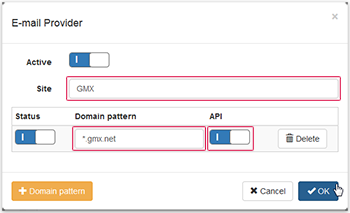 In the site field, enter GMX, use GMX as domain template, and activate the API checkbox. Set up encrypted communication as described in this documentation. Import your old key pair, see Managing Keys.